On 10 May 2017, the Unrepresented Nations and Peoples Organization (UNPO), in cooperation with Mr Csaba Sógor MEP (EPP) and Mr Francisco Assis MEP (S&D) and Mahatma Gandhi International, will convene a conference entitled “Who Pays the Price? 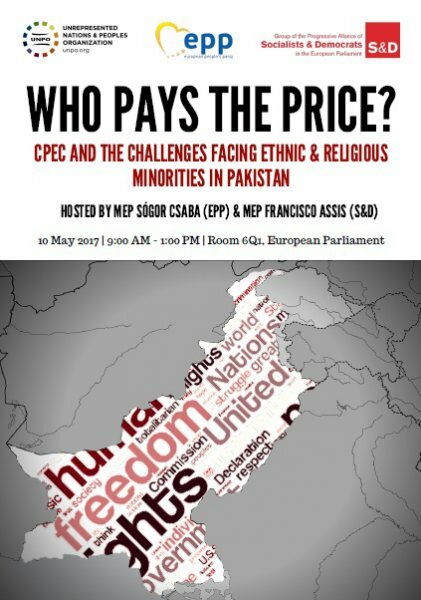 CPEC and the Challenges Facing Ethnic & Religious Minorities in Pakistan”, at the European Parliament in Brussels. 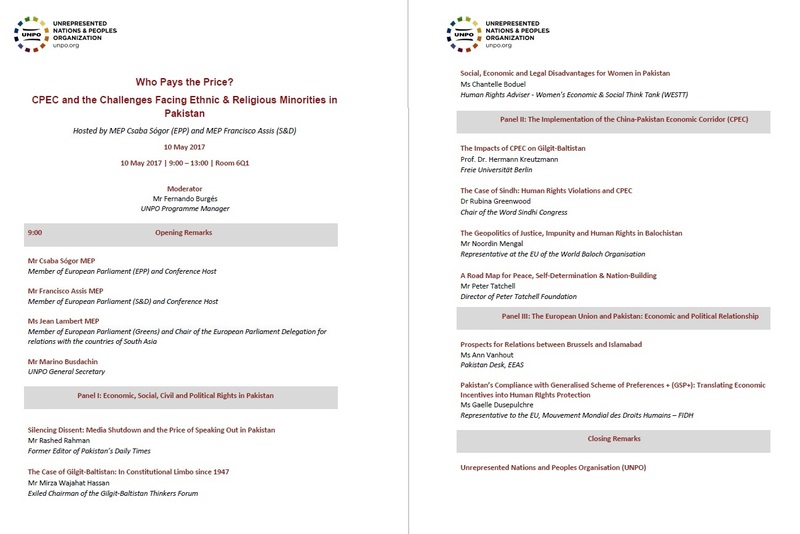 The event will discuss the ongoing human rights violations against ethnic and religious minorities in Balochistan, Sindh and in the occupied territory of Gilgit-Baltistan; the severe impacts of the China-Pakistan Economic Corridor (CPEC) being implemented against the will of the local people; and the economic and political relationship between the EU and Islamabad. Despite having ratified some of the most important human rights treaties, Pakistan continues to struggle with the implementation of international law. Amid the spiral of violence, the most affected are inevitably religious and ethnic minorities, above all women and children. Worsening an already fragile situation, minorities struggle with the implementation of the China-Pakistan Economic Corridor (CPEC), the US$46-billion mega project that will further consolidate economic, political and military ties between Beijing and Islamabad. Although it comes with promises of development and jobs, the local population along the route which CPEC cuts through have not been consulted nor received compensation for the exploitation of its ancestral lands. In addition, the increasing number of Chinese military settlings in Balochistan is destabilising the already fragile demographic situation of the region. The European Union is a major stakeholder in Pakistan under the tariff benefit scheme (GSP+). It is, therefore, imperative that European policy-makers and officials have a clear and updated understanding of Pakistan’s compliance with its human rights obligations under the scheme and the international law. Building on a series of events on the human rights situation in Pakistan organised by UNPO, this upcoming conference will offer a renewed opportunity for EU officials, academics and CSOs representatives to discuss constructive approaches to ensure that ethnic and religious minorities in Pakistan are protected. The event will also be streamed live on UNPO's Facebook page. Meeting point: Main entrance of the European Parliament (in front of Luxembourg Square) at 8:30am. Members of UNPO will be holding a poster of the event.